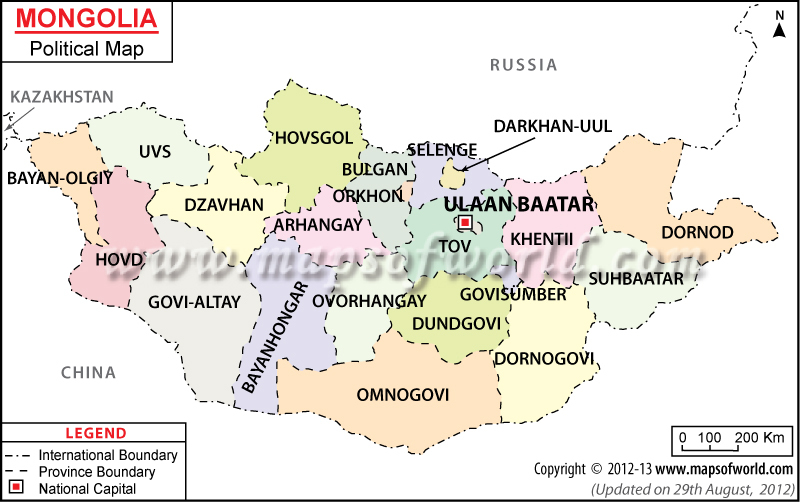 Mongolia Map helps to locate the important provinces into which the country is divided along with their capitals. Mongolia is located between the countries of Russia and China. It lies on the coordinates of 46° North latitude and 105° East longitude. The flag of Mongolia has three vertical stripes of red, blue, and red. Along the red stripe on the hoist side is the soyombo national symbol in yellow. Mongolia has a long history of inhabitation, from the Homo erectus, to the arrival of humans in the Paleolithic age. The early people of Mongolia lived in nomadic communities, including the Xiongnu, who date back to the 3rd century BC. The powerful Xiongnu empire expanded across the region, causing the Chinese to build the Great Wall to protect their territories. Later came the Xianbei empire, during which several major dynasties emerged. Genghis Khan emerged as a leader in the 12th century, uniting the various Mongolian people under the Mongol Empire, which was the largest empire the world has ever seen, covering about 22% of Earth's land. The Mongol Empire became divided into four khanates after Genghis Khan died in 1259. His grandson, Kublai Khan ruled the Great Khanate, which was later replaced by the Chinese Ming Dynasty while the Mongols were forced out of China. The various khanates ruled Mongolia until the 17th century, when the last of the Khans, Ligden, died. After his death, much of Mongolia became part of the Qing Dynasty, lasting until 1911. The Qing Dynasty collapsed and Mongolia's Bogd Khaan declared independence. The Republic of China still claimed Mongolia's territory, invading it in 1919. With help from Russia, Mongolia declared independence again in 1921, soon becoming a communist country. After the collapse of the USSR, Mongolia transitioned into a democratic nation in the early 1990s. Mongolia is situated between Russia and China, and is located near Kazakhstan. Mongolia is a large country spanning central Asia, situated in the Gobi Desert and mountains. Mongolia's mountain ranges include the Altai Mountains, Khangai Mountains, and Khentii Mountains. The highest peak in Mongolia is Huiten Peak along the western border with China, which stands 4,374 meters (14,350 feet) above sea level. The terrain of Mongolia features rolling steppes and mountains formed by melting glaciers, forests, grasslands, marshlands, and sandy dunes. Mongolia has the world's lowest population density, and as such has vast regions of untouched landscape. 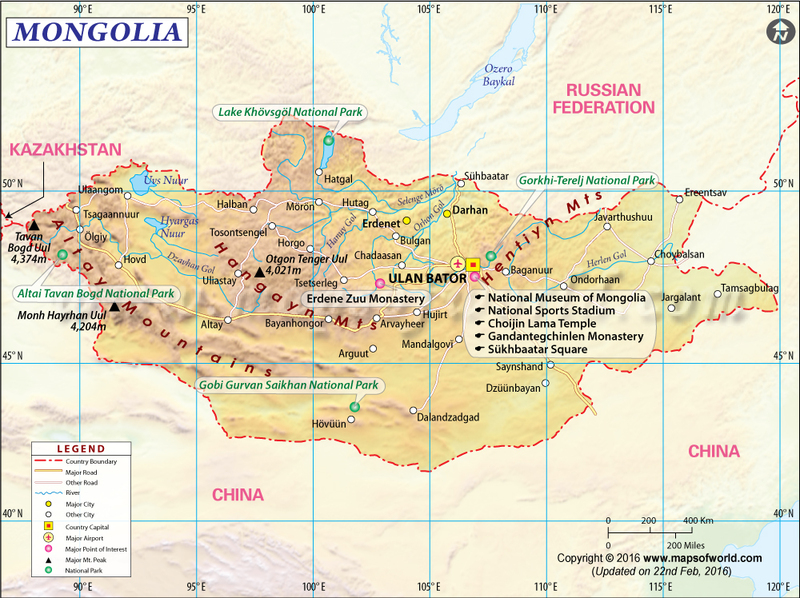 Northern and western Mongolia are geothermal zones with volcanic activity, earthquakes, and natural hot springs. Mongolia's Lake Khovsgol is one of the largest freshwater lakes on the continent, and one of Mongolia's distinguishing features. Another major lake is Lake Baikal, while important rivers are the Selenge, Yenisei, Tuul, Argun, and Amur Rivers. Mongolia's vast scenic spaces are its best resource and greatest attraction, with many areas untouched by modernity. The nomadic Mongolian communities across the countryside can be experienced on any of the various tours to see their way of life. Some of the country's major natural sites are Altai Tavan Bogd National Park, where the highest peak and largest glacier in the country are located. Also within the national park is a UNESCO World Heritage Site, with thousands of ancient petroglyphs as well as other ancient sites. More national parks include Khustain Nuruu National Park, home to wild horses, and Gobi Gurvan Saikhan National Park, where visitors can see sand dunes and desert landscapes. Another national park in Mongolia is Gorkhi-Terelj National Park, not far from the capital, Ulaanbaatar. Ulaanbaatar itself is home to several monasteries, museums, and historic sites, like the Zaisan Memorial from Mongolia's communist period. Also outside the capital is Bodgkhan Uul, a mountainous reserve with plenty of hiking opportunities. The major airport in Mongolia is Chinggis Khaan International, outside of Ulaanbaatar. Flights are available from select destinations across Europe and Asia. Another option for entering the country is via the Trans-Siberian railway, with service to major cities in Russia and China. Long-distance buses from Beijing are also available. Roads in Mongolia are not typically paved once you leave Ulaanbaatar, but minibuses and buses can be found for transportation within Mongolia. In towns, travel by taxi, horse, or by foot tend to be the most common options. What was The Extent of The Mongol Empire?